One of the UK's most feted underground artists, Banksy, has launched a rare exhibition featuring live cows, sheep and pigs. Celebrities including Jamie Oliver, Sara Cox and Jarvis Cocker attended Thursday's launch - but Banksy himself left before the party to avoid the spotlight. Banksy, from Bristol and whose real name is Robin Banks, has been hailed as "Britain's most celebrated graffiti artist" and designed Blur's latest album cover. He avoids exhibiting in galleries - but his latest show, Turf War, has taken over a warehouse in east London for five days. 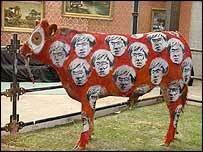 The exhibition includes pigs painted in police colours, sheep painted in concentration camp stripes and a cow covered in images of Andy Warhol's face. They are all show animals from Cheddar, Somerset, which are used to being on public view, and the paint was animal-friendly, a spokeswoman said. And an inspector from the RSPCA approved the animals' conditions, she added. "I think he was a bit dazed by the whole event. But he OK'd it all." 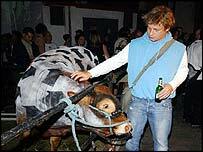 But one woman took offence to animals being used as art, and chained herself to railings surrounding a decorated cow. Debbie Young and two other protesters were demonstrating at what they saw as animal cruelty. Turf War also includes a sculpture of Rodin's The Thinker with a traffic cone on its head and "piles of burnt-out police cars". Banksy, who prefers to avoid publicity to retain his anonymity, left the warehouse at about 1700 BST on Thursday - before the party started. The spokeswoman said the exhibition did not mark Banksy's entrance into mainstream culture. Banksy has turned down four requests to do adverts for Nike and his work is usually seen only on walls in cities across the world. He has previously painted the Queen as a chimpanzee during her Golden Jubilee and sprayed "Mind the crap" on the steps of the Tate Britain before the Turner Prize ceremony. He has said "the buzz" of graffiti gives him more pleasure than if all his work was in the Tate Modern with "Tony Blair and Kate moss on roller blades handing out vol au vents". What do you think of Banksy's exhibition? This debate is now closed but please see below for a selection of your comments. I think its great, everyone's taste is different, so a conclusion on whether its good or bad will never be reached, but if art is meant to stimulate the senses and popular debate, its served its purpose fully. I too think the use of live animals (sprayed or not sprayed) in some pretentious artist's 'work' is totally abhorrent. It may be described as 'animal friendly' paint - but did they stop to consider that it was probably only so, due to it having been tested on animals in the first place?! A big city is no place for farm animals - it's stressful enough for people, who at least know what's going on around them. This isn't art - it's just a cheap gimmick. Painting cows ... definitely original. Anyone, who knows anything about art and its history, understands that great artists are 'great' because they did something either better than anyone else or completely original. Take Delacroix, Manet, Picasso, Duchamp or Pollock as an example. The people who visit museums and galleries to feel 'cultured' would not understand this concept. I do not agree with defacing public property; but that is a moral issue rather than an answer to is he an artist. Maddy from Newbury would do well to find out more about this artist, and his medium, before dismissing him. Nothing artistic about graffiti? Nonsense. If art is self-expression then graffiti more than fits the bill, despite the hoards of unimaginative oiks spraying their 'tags' on buses persuading the public otherwise. As for Banksy himself, his skilful use of stencils and choices of location have produced some very powerful statements - often humorous, always opinionated - and have marked him out as one of the true individuals on the British art scene. And you don't have to pay a tenner at the Saatchi for the privilege to look at them. I think its cool. It's original, stylish and amusing! i don't know how you can suppose that the cows look "bemused" at all, for a start you can barely see their faces and even then, there aren't many people who claim an empathic link with livestock. Also, you can't just pigeonhole the guy because his work comes under the same title as a form of vandalism: we all appreciate a good fireworks show and yet we don't complain that its an inspiration to arsonists. There is simply no reason to allow an overly generic term to blinker your views upon what is, quite tangibly, art. Plans for a similar exhibition by a Belgian artist - who wanted to use pigs, animals particularly sensitive to stress - were halted by the Belgian authorities, as there is a law in Belgium against using animals in this way. I find the trend of 'artists' using live animals and turning them into objects cruel and unacceptable. The RSPCA must have gone mad. Coming from Bristol, I've grown up seeing Banksy's art all over town. It brightens up dull and drab concrete surroundings, but more importantly gives pause for thought and often a chuckle. Good on him getting a higher profile, whilst retaining his 'masked tagger' anonymity. Visit his website and look at the quality and subtleness of his style. You'll be surprised! Any chance of someone spray painting on the body of Robin Banks and parading him in public? If anyone's seen Banksy's work around the South Bank in London they'll realise the majority of it is funny, socially aware and never an eyesore. His chequebook vandalism piece which was seen just before a view of London's financial district was inspired and attractive. At least he didn't have to kill the animals and stick them into formaldehyde in order to create art. Well, it certainly gives the cows a break from their otherwise rather dull day! I do get tired of these "artists" having a pop at our police system all the time. No wonder Mr. Banks feels the need to hide his face since he's obviously wanted for defacing public and private property all over the country. I agree that people should make statements but I see nothing particularly artistic about graffiti or, indeed, his exhibition. Drawing on a cow? Big deal. Yawn. It's disheartening to see that his attitude has landed him with a hero title amongst the younger generation. There is little enough respect for people or property in our society as it is without someone like him actively promoting it. I just hope that if Mr. Banks is ever on the receiving end of a criminal act he doesn't even contemplate phoning the police for help. So if this guy is seen as a hero among the ranks of the not-so-talented graffiti "artists", how long do you think it will be before his work is copied and some poor dog or cat is spray painted with NOT so animal friendly paint? The irresponsibility of Mr Banks, the RSPCA and the visiting celebrities is breathtaking. Why not! It may even spark a multi-million pound advertising industry for farmers, meaning no more subsidies. He should have painted polar bears, tigers and waterbuffalo. That would have been a real challenge. Hey, he could have painted recopies on Jamie Oliver! If you don't want people to paint and be creative on public walls, than give them the chance to paint the walls of the street to make the street an attractive place, like in Vancouver B.C. or Los Angeles. Art is helpful and can help your city. I do not agree with the use of animals in the exhibition, they quite clearly look bemused and must be terrified. I am shocked that the RSPCA approved of this, and will think twice before making any more donations to the charity if it thinks this sort of treatment of animals is acceptable. The RSPCA does wonderful work and since when do cows get bemused? Banksy has a sense of humour - how many artists have that? I love graffiti but i think it is cruel and totally unnecessary to exhibit animals in this way. The animals will be stressed in this environment where they are in a warehouse in a big city with lots of people around. Is it worth the suffering of other living beings for us to have a bit of a laugh? Have always been a fan of Banksy. Now I think he is just another corporate puppet, displaying to the celebrity masses by means of animal exploitation. Grow up, animals are not there for your amusement you puppet. I believe that Bansky itself is a fine example of modern art. The use of animals is intendeed in the same way artist like Spence Tunick can view the human body, to censor Bansky it would be the same to call Tunick "Inmoral"
I went along to the launch, i think it's a great exhibition and the animals were fine... in fact they were better treated than 99% of farm animals so why don't people chain their heads to the local dairy? The only disapointment was that the event was in sponsored by a sportswear firm and was put together by a PR company. I rate this guy as an extremely important artist, creating and contributing to the flava of our generation, our nation and he has indeed become an artist of this era. While I recognise that it was right to send the animals home after one day in the city I do not agree that they should not become objects for art works, art should cover everything, anything and nothing. It is a shame that there are so many uneducated people ready to dismiss the work of a genius. Check out the movie 'Style wars' or the book 'Subway art' and maybe you will understand where it's all about..maybe.. Go Banksy! AJ - Cows always look bemused. Most Popular Now | 29,614 pages were read in the last minute.